Dozens of people have been injured as a powerful earthquake of magnitude 6.8 hit Japan's main island of Honshu. 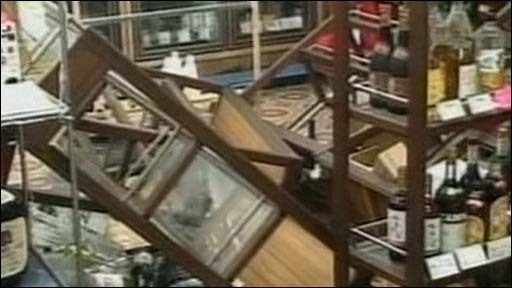 The quake's epicentre was very deep, but it still caused damage to buildings and left thousands without power. A number of cars were buried in a landslide, local television said, and the earthquake triggered fires and shattered windows. The tremor also caused traffic disruption, with motorways closed and train services cancelled. Police said at least 90 people were taken to hospital with injuries, according to the AFP news agency. Hundreds of people were trapped in stranded trains, reports said. The earthquake, which struck at 0030 local time (1530 GMT) on Thursday, was centred 120km (75 miles) underground, in the Iwate prefecture near Morioka, Japan's Meteorological Agency said. The agency said there was no threat of a tsunami from the quake, which was felt as far away as Tokyo, some 500km (310 miles) to the south. Prime Minister Yasuo Fukuda called on officials to "do their best" to rescue anyone trapped by the earthquake. Emergency officials were deployed to the area as military planes flew over the worst-hit region in an attempt to assess the extent of the damage. Japan is one of the world's most earthquake-prone countries and experiences thousands of tremors each year.